It’s the Featured Stamper challenge over at Splitcoast today and we’re honoring Mary. My inspiration comes from this wonderful card of Mary’s. And I’ve also been inspired by this gorgeous card from Jennifer McGuire. My card starts out with a piece of SU! Naturals Ivory. Using Glue ‘n Seal I pasted a page from an old encyclopedia. Next comes more Glue ‘n Seal and bits of torn Tim Holtz tissue wrap. More Glue ‘n Seal and then some torn bits of Tim Holtz Tissue tape. Note there’s lots of drying with my heat gun in between adding layers. A layer of Pumice Stone Distress stain is next. Then I started adding color with Distress Stains in Shabby Shutters and Tumbled Glass here and there. 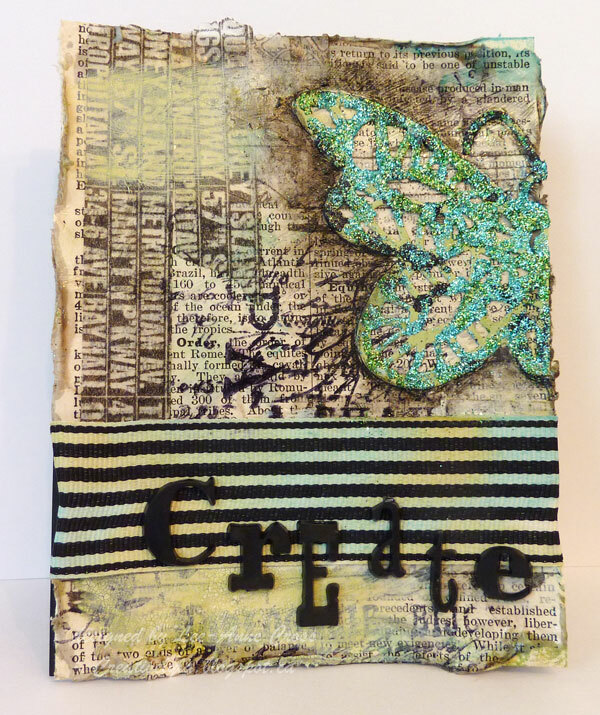 Next, I added some stamping with various Tim Holtz images. I like to use Ranger Archival ink for this step and only use partial images by pressing the stamps onto the page with my fingers, not a block. Then some Picket Fence Distress Ink randomly over parts of the page. The butterfly was die cut and I added three different colors of glitter. Once it was adhered to the page, I used my Black Soot Distress marker to add shadowing around the butterfly. It was smudged to create some depth and the illusion of movement. Since Mary’s card had some ribbon on it, I added a wide piece of striped ribbon, then dotted some of the same distress stains on it and added a bit of water to dilute the color. And finally, some Tim Holtz Alphaparts for the sentiment. Paper: SU! Naturals Ivory, Gina K. Pure Luxury black, and an old page from an encyclopedia. You did a great job on this – mixed meida girl 🙂 Love the wide striped ribbon and the partial butterfly as well as the staggered letters. Lovely cards on your other two posts too – pressed for time due to Diva commitments so sorry to comment all on one.